Svetlana Alexievich is giving a lecture at SNU on May 22. 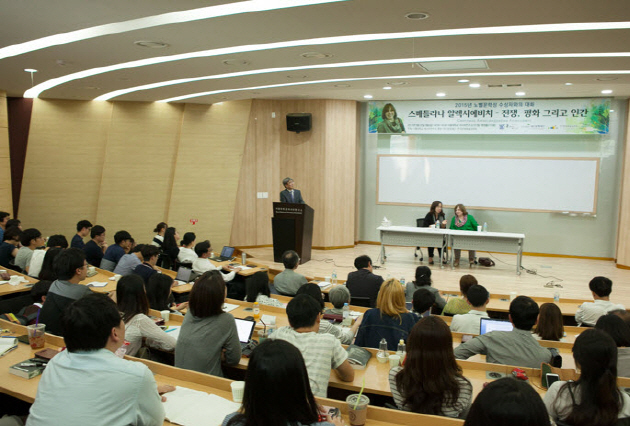 On May 22, Svetlana Alexievich, recipient of the 2015 Nobel Prize in Literature visited SNU to give a lecture titled, “Peace, War, and Human.” The talk focused on various topics covered in her literary works, and was followed by a question and answer session with the audience. Alexievich was born on May 31, 1948 in Stanislav, Ukraine to a Belarusian father and a Ukrainian mother. She spent her childhood in Belarus and went on to write about some of the major events of the Soviet era and post-Soviet society. Her “documentary novels” incorporate elements of investigative journalism and blurs the boundaries between reporting and fiction. Her raw and revealing work led to her being persecuted by the Belarusian government, and she fled the country in 2000. Some of Alexievich’s most notable pieces include War’s Unwomanly Face (1985), in which she gathered the stories of women during World War II and Voices from Chernobyl (1997), a recollection of victims’ memories of the tragic 1986 nuclear accident. The lecture room was filled with students and some of them had to sit on the floor. In her talk, Alexievich noted that she chose to portray the war from the viewpoint of women in War’s Unwomanly Face to explore war beyond the context of the male-dominated battlefield, showing that women were not marginalized witnesses but active agents in, as well as victims of war. By including the accounts of Germans and Russians, so frequently cast as the enemy in portrayals of war, she wanted to highlight the humanity behind nationalist labels. 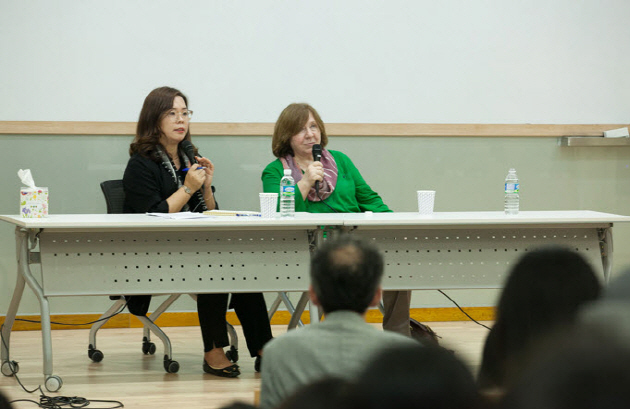 SNU’s President Sung Nak-in was present at the talk and personally thanked Alexievich for her visit. Inspired by her work and her passion, students, professors, and other members of the audience expressed their gratitude for her visit.